Do you need a new hiking backpack? 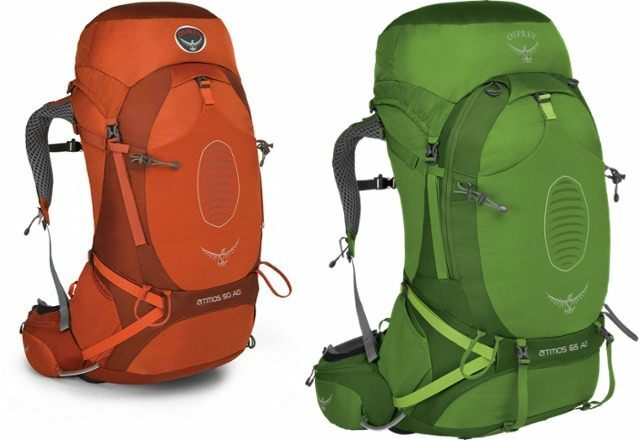 Osprey is one of the leading brands of hiking backpacks and the Atmos is one of their most popular models. Depending on the length of your next hiking trip, you may want to consider getting the Atmos 50 or Atmos 65. Explore the details of these two packs to find out which is the better option. The Osprey Atmos 50 is a sturdy hiking backpack with three interior pockets and one exterior pocket. It is constructed from the water resistant synthetic material. The Osprey Atmos 65 is constructed from durable, water-resistant nylon. With this backpack, you also get three interior pockets. However, you also get five exterior pockets, instead of the one pocket found on the Atmos 50. Both backpacks feature the same impressive suspension system. These are comfortable backpacks that easily adjust to fit your back. The harness adjusts to the length of your torso. This has become standard for the latest Osprey hiking backpacks. They also include removable top lids to reduce the size of the backpack. After you remove the top lid, you can fold the flap jacket over the opening to secure the bag. As expected, you also get attachment points for ice axes and trekking poles. The attachment points are loops of bungee cord sewn to the exterior of the backpack. The Atmos 50 and 65 also include bright red compression straps. These straps go inside the main compartment and are used to secure your gear when you do not have a full load. This keeps your gear from moving around in the backpack as you hike.The final similarity is the hip belt. The hip belt is adjustable to accommodate your waist size and to help provide more stability. The biggest difference between the Osprey Atmos 50 and the Atmos 65 is an obvious one. The Atmos 65 offers more storage space than the Atmos 50. As the name implies, the Atmos 65 has a volume capacity of 65 liters, while the Atmos 50 has a capacity of 50 liters. While it should not be a surprise that the Atmos 50 is lighter, both bags are about the same width. They should fit on your shoulders about the same. However, the Atmos 65 is much taller. The height of the bag is where the different volume capacity comes from. You can also choose from three sizes, for both the Atmos 50 and 65. The medium is the standard size. Choosing the small or large will not dramatically change the volume capacity. Instead, the size provides a minor change to the height to accommodate people of different heights. The next difference is the access panel for reaching the main compartment. Both backpacks include a large top panel with a zipper. You can open the top panel to reach the main compartment. However, it is difficult to reach the items at the bottom of the bag. With the Atmos 65, you get a zippered access panel along the bottom of the backpack. When you set the backpack on its side, you can unzip the bottom for easier access. Besides the volume capacity and access to the main compartment, you will notice a few more differences. The next issue is the exterior pockets. The Atmos 50 offers one large exterior pocket, while the Atmos 65 provides five pockets. These are zippered pockets, which helps keep your gear from falling out. Verdict – Which Atmos Backpack Should You Choose? Choosing between the Atmos 50 and 65 is a difficult choice. Not only are these two backpacks made by the same company, they are also different versions of the same model. The main difference is the size of the backpacks.The Atmos 65 is a 65 liter pack, while the Atmos 50 has a 50 liter capacity. If you need the extra space, the Atmos 65 is the better bag. It also includes a bottom access panel for reaching the main compartment and extra exterior pockets. However, if you do not need 65 liters, you may save some money by purchasing the smaller backpack.